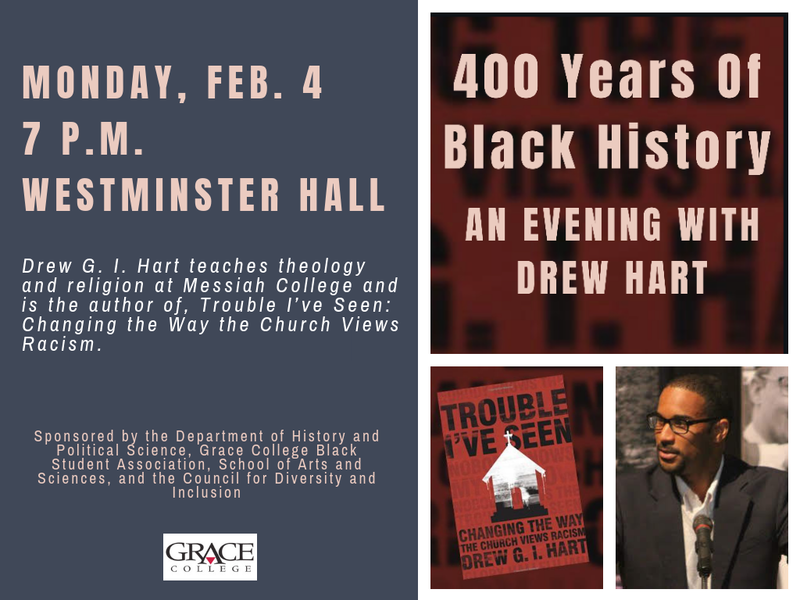 The Grace College Department of History and Political Science, School of Arts and Sciences, Black Student Association and Council for Diversity and Inclusion are pleased to welcome Dr. Drew Hart, author and professor of theology and religion at Messiah College, to campus this February. 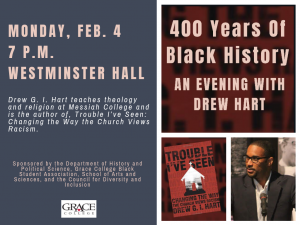 The event, entitled “400 Years of Black History: An Evening with Drew Hart,” will take place at 7 p.m.on Monday, Feb. 4, in Westminster Hall. The evening will include a presentation from Dr. Hart, a time for questions and answers, a book signing and refreshments. In 2017, Dr. Hart was the recipient of bcmPEACE’s Peacemaker Award and Hart’s book, “Trouble I’ve Seen: Changing the Way the Church Views Racism,” was chosen as a 2016 Book of the Month by Englewood Review of Books. Copies of “Trouble I’ve Seen” will be available for purchase and signing by Dr. Hart on Feb. 4. The public is invited to attend this free and informative event.